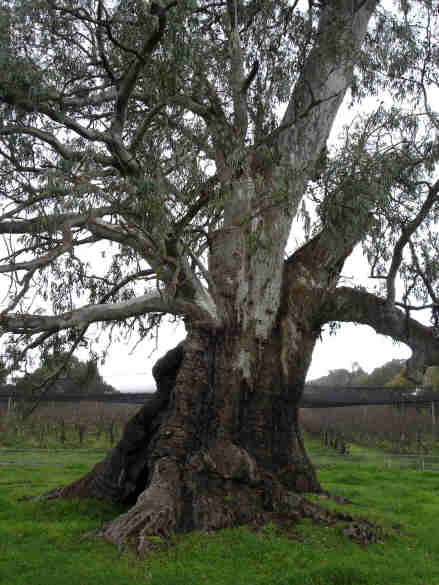 There are a number of very well known trees in South Australia which represent a large amount of history. 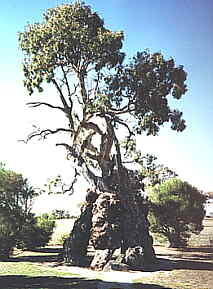 Among them is the best known tree of all, The Old Gum Tree at Glenelg. Unfortunately it is not THE tree under wich Governor Hindmarsh was supposed to have made his proclamation of the Colony of South Australia, which was not a proclamation at all! This had already been done in England on 19 February 1836. 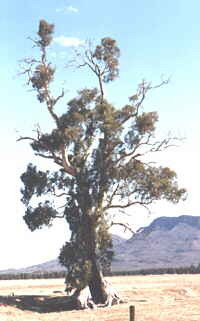 This tree was on the banks of a branch of the Neales River under which John Forrest camped in 1874 after his successful expedition from Geralton in Western Australia to the Overland Telegraph line. When the railway line was extended from Oodnadatta to Alice Springs it was suggested by many people that it should be protected. This hollow tree trunk provided a 'home' for Friedrich and Caroline Herbig and two of their 16 children until 1860 at Springton. Johann Friedrich Herbig (27) arrived in South Australia on the Wilhelmine from Bremen on 3 October 1855. While looking for employment he went to the Adelaide Hills where he worked for George Fife Angas. He later leased a block of land of eighty acres from Angas at Black Springs, later called Springton (Map). This was on a time payment and enabled him to start out on his own and pay off the land over a number of years. Being still rather poor Friedrich lived in the base of a very large gum tree which was located on his own land, thus saving rent or the cost of having to build a hut or house. He soon got to know Anna Caroline Rattey, who had arrived on the Vesta from Hamburg on 1 December 1856, and lived now at Hoffnungsthal in the Barossa Valley. Friedrich and Caroline married in 1858 and Caroline moved into the tree house in which Friedrich had been living for nearly three years. A year later the first of their sixteen children, Johann August, was born in the tree. After the birth of their second son in 1860 the tree house became too small and a hut was built to accomodate the growing family. Whether alive or dead, canoe trees are the remnants of an inportant Aboriginal industry. Most of them can be found along Lakes Albert and Alexandrina, the Coorong and the River Murray and its tributaries. It was mainly the river red gum, (Eucalyptus camaldulensis), from which the Aborigines cut and peeled long sheets of bark to make their canoes. The art of making these rafts was practised by most Aborigines in Australia from the rivers to the coasts. As early as 1642 Abel Tasman had seen them in use on the north west coast of Australia. The majestic red gums have always appealed to Australians. It was photographer Harold Cazneaux who took a picture of one of these giants, with the walls of Wilpena Pound as background, in May 1937. He regarded it as his most Australian picture and called it the Spirit of Endurance. It won many awards in Australian and International exhibitions. This giant gum tree stands in solitary grandeur on a lonely plateau in the arid Flinders Ranges, South Australia, where it has grown up from a sapling through the years, and long before the shade from its giant limbs ever gave shelter from heat to white men. The passing of the years has left it scarred and marked by the elements - storm, fire, water, - unconquered, it speaks to us from a Spirit of Endurance. Although aged, its widespread limbs speak of a vitality that will carry on for many more years. One day, when the sun shone hot and strong, I stood before this giant in silent wonder and admiration. The hot wind stirred its leafy boughs, and some of the living elements of this tree passed to me in understanding and friendliness expressing The Spirit of Australia. Harold Cazneaux was born in 1878 in New Zealand of Australian parents. He lived in Adelaide until 1904, when he moved to Sydney where he died on 19 June 1953. 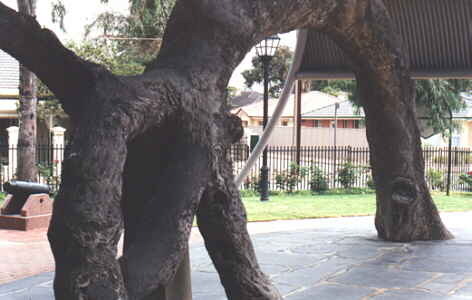 Today this famous tree is known simply as the Cazneaux Tree. 'The Spirit of Australia' is now proudly displayed on every Qantas plane. During 1926 Heysen had visited the Flinders Ranges and was highly impressed with its scenery, in particular its great variety of beautiful gum trees. Many years later he wrote a letter to Hans Mincham in which he said; 'The Flinders region has held a 'spell' over me ever since I first went to Quorn and Hawker looking for new material for brush and pencil. Since then my interest in this unique landscape has grown with each successive trip. The great Red Gums in the creek beds fill me with wonder; their feeling of strength of limb, of vigour and life, suggest the very spirit of endurance'. 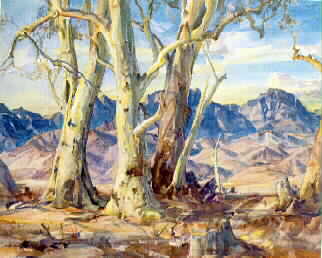 His well-known watercolour, Guardian of Brachina Gorge, was finished in 1937 at the Cedars from several drawings made in the early 1930s. He soon turned out a large number of very detailed sketches and paintings of these trees, and the Australian bush. Apart from these he also painted still lives, portraits, pastoral scenes and seascapes, using oil, watercolour, pencil, chalk, acrylic and charcoal. 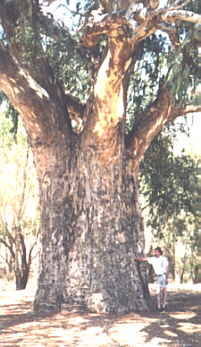 This giant red gum tree near Orroroo measures more than ten metres in circumference and is estimated to be at least 500 years old. 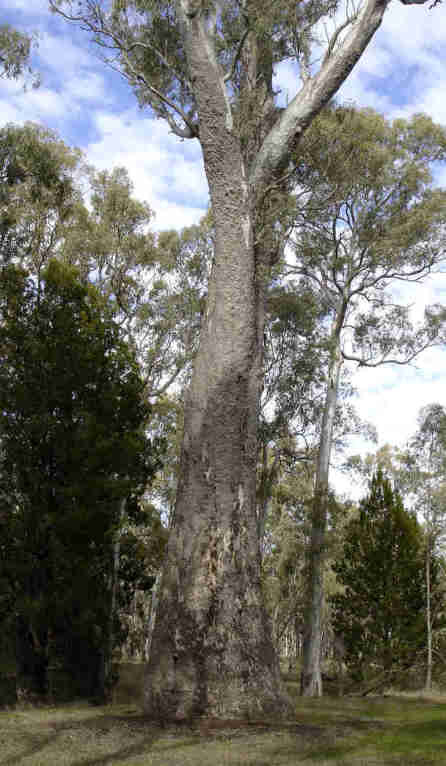 The 400 year old King Tree grows in the Wirrabara forest. Monarch of the Glen at Brown Hill Creek. This River Red Gum is about 400 years old. 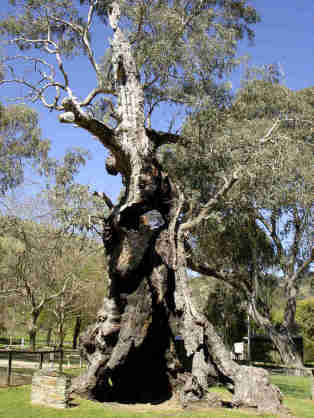 Several generations of early settlers have used the burnt out trunk as their first home in South Australia, much like the Herbig Family at Springton. The stones at the base of the tree come from the Brown Hill Creek Chapel, built in 1874 and burnt down in 1952. Brown Hill Creek, or Wirraparinga to the Kaurna Aborigines was a favourite camping, hunting and gathering area. Depending on the seasons as many as 150 people would gather in the area to avail themselves of its resources. 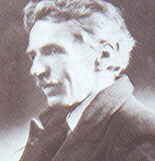 Pastor William Finlayson was the first European to settle there in 1837. Catherine Helen Spence, when still a child, also lived at Brown Hill Creek. BIG GUM TREE at Forreston. 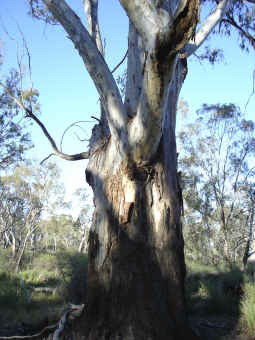 This River Red Gum can be found near Quinns Road. 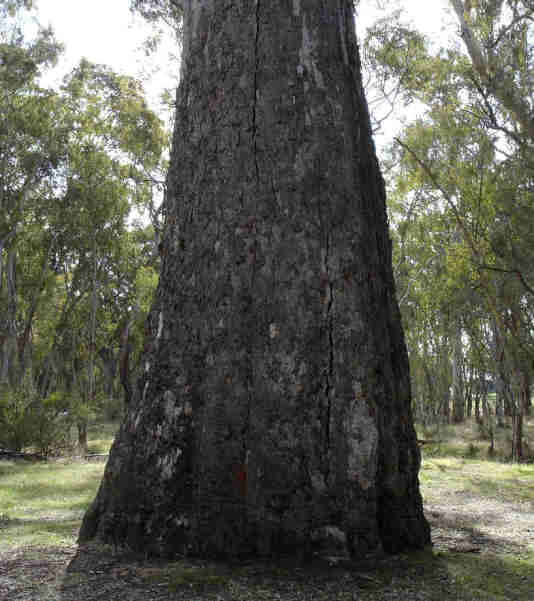 It has a girth of 13.843 metres, is 25 metres tall and is more than 600 years old. As with several of the other trees mentioned above, because of its hollow trunk it has provided a home to many of the early settlers in and around Forreston.